In the SEC, John Calipari welcomes another elite recruiting class to Kentucky while Ben Howland begins to rebuild Mississippi State. Don’t expect many familiar faces when Kentucky takes the floor this winter. The Wildcats sent seven players from last year’s roster to the NBA, most notably forwards Karl-Anthony Towns (whom Minnesota selected with the first overall pick) and Willie Cauley-Stein (whom the Kings selected with the No. 6 pick). Those seven players accounted for 61.6 points per game last season, or 82.8% of the team’s scoring output. They also helped Kentucky to SEC regular-season and conference titles a 38-0 record before falling to Wisconsin in the Final Four. Any other school would worry about that kind of mass exodus, but the ‘Cats aren’t fretting. If we’ve learned anything about John Calipari, it’s that the coach knows how to reload. Forward Alex Poythress and guard Tyler Ulis should step up and assume bigger roles in 2015-16. Plus, Calipari has another stellar crop of recruits lying in wait. Five-star prospects Skal Labissiere, Isaiah Briscoe and Jamal Murray (who reclassified so that he can play this fall) will add more top-tier talent to the roster when they arrive in Lexington. The Wildcats won’t look the same next season, but it’s far too early to count out Calipari in the SEC. The conference should still be Kentucky’s to lose next year. The biggest coaching transaction in the SEC took place in ... Starkville? Mississippi State made a splash by luring former UCLA coach Ben Howland out of a two-year coaching hiatus to take over the Bulldogs. Howland replaces Rick Ray, who was fired after three seasons. ​Howland’s arrival might have involved a bit of sticker-shock. He took UCLA to three Final Fours in 10 seasons in Westwood. Mississippi State has only been to one Final Four (1996) in its history and hasn’t reached the NCAA tournament since 2009. But at his introductory press conference, Howland said he sees a bright future with the Bulldogs. It’s hard to argue against Howland’s track record. He’s taken three teams (Northern Arizona, Pittsburgh, UCLA) to the NCAA tournament. At UCLA, Howland sent 18 players to the NBA. The coach hasn’t wasted any time making an impression, either: He beat out Kentucky and Kansas to secure the commitment of five-star guard Malik Newman in April. That means the rest of the SEC is officially on watch. It felt like a long time coming when Donovan announced his departure from Florida at the end of April. The longtime Gators coach flirted with the NBA on a number of occasions, even accepting the Orlando Magic job in 2007 before changing his mind and returning to Gainesville. But the opportunity to coach the Oklahoma City Thunder was too much for Billy the Kid to pass up. After 19 seasons, Donovan left the SEC. Donovan’s departure leaves a gaping hole in the league. For much of his tenure, the Gators were regularly among the SEC’s most dangerous contenders for a national title. The coach won two national championships and appeared in four Final Fours at Florida, and despite coming off his first losing season (16-17) since 1998, Donovan was only one season removed from a Final Four berth (2014). It’s hard to imagine a coach with bigger shoes to fill than Michael White, who was hired on May 7 to replace Donovan after four seasons at Louisiana Tech. The SEC will surely miss Donovan’s success. Alabama: Clean the glass! The Crimson Tide must improve on a 12th-place finish in the SEC in rebounding margin (-0.4) all while losing graduated star Levi Randolph (5.1 rebounds per game). Arkansas: Find some new offense. The Hogs lose their top three scorers from last year, including explosive forward Bobby Portis (17.5 points per game), the reigning SEC Player of the Year. Auburn: Get used to defensive drills. Bruce Pearl’s first losing season as a head coach came courtesy of a defense that finished last in the SEC in efficiency and effective field-goal percentage in 2014-15. ​Florida: Spend some quality time at the charity stripe. The Gators’ dismal free-throw percentage (63.5) last season ranked 333rd nationally. Georgia: Fill in the frontcourt. Bulldogs’ forwards Marcus Thornton and Nemanja Djurisic combined for 23.3 points and 12.5 rebounds per game last year, but that duo is now gone. Kentucky: Try to maintain the status quo on defense. Departed seven-footers like Towns and Cauley-Stein were the heart of one of the best defenses in modern college basketball. Could Labissiere fill the void immediately? LSU: Make room for highly touted freshmen. 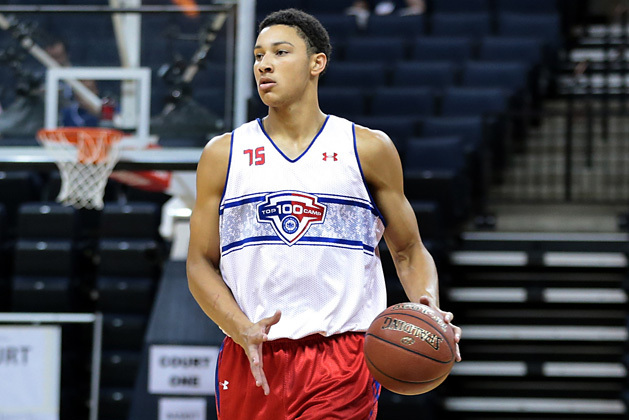 The Tigers’ hyped 2015 signing class includes forward Ben Simmons, the No. 2 player in the nation, and guard Antonio Blakney, who is ranked No. 13. Mississippi State: Learn how to take care of the basketball. The Bulldogs finished last in the SEC in turnover margin (-2.7) and 337th nationally in turnover percentage (23.3) last year. Missouri: Forget last season. Missouri’s nine wins were its fewest since the 1966-67 season, but young talent like Wes Clark and Montaque Gill-Caesar should return. South Carolina: Embrace young experience. Coach Frank Martin’s roster loses only one senior (Tyrone Johnson) and returns its two leading scorers in sophomores Duane Notice and Sindarius Thornwell. Tennessee: Find a new floor leader. Coach Rick Barnes inherits a team that loses impact guard Josh Richardson, who led the Vols in scoring (16.0 points per game) and earned SEC All-Defensive Team honors. Texas A&M: Focus on finishing. The Aggies won 21 games last season but lost five of their last seven games, including an opening loss to Auburn in the SEC tournament. Vanderbilt: Learn how to defend the three. Vandy’s defense was one of the most efficient in the SEC, but the ‘Dores still allowed teams to shoot 38% from beyond the arc in conference play, worst in the league.